^ 1.0 1.1 Business Development/Japan. Sony Computer Entertainment Inc. [2007-12-19]. （原始内容存档于2004-04-22）. ^ 2.0 2.1 2.2 Business Development/North America. Sony Computer Entertainment Inc. [2015-11-16]. （原始内容存档于2012-02-27）. ^ 3.0 3.1 Business Development/Europe. Sony Computer Entertainment. [2007-12-19]. （原始内容存档于2004-04-22）. ^ 4.0 4.1 SCEE 1995—Key Facts and Figures. Sony Computer Entertainment. [2015-11-16]. （原始内容存档于2009-08-12）. ^ 5.0 5.1 5.2 PlayStation Cumulative Production Shipments of Hardware. Sony Computer Entertainment. [2012-12-12]. （原始内容存档于2011-07-22）. ^ 6.0 6.1 6.2 Sinclair, Brendan. Sony stops making original PS. GameSpot. 2006-03-24 [2015-10-02]. （原始内容存档于2015-01-29）. ^ Gran Turismo Series Shipment Exceeds 50 Million Units Worldwide (新闻稿). Sony Computer Entertainment. 2008-05-09 [2008-06-03]. （原始内容存档于2008-05-26）. ^ 'Gran Turismo' Series Software Title List. Polyphony Digital. March 2010 [2010-10-24]. （原始内容存档于2007-02-06）. ^ PlayStation 2 Breaks Record as the Fastest Computer Entertainment Platform to Reach Cumulative Shipment of 100 Million Units (PDF) (新闻稿). Sony Computer Entertainment. 2005-11-30 [2008-06-08]. （原始内容 (PDF)存档于2006-01-03）. ^ Evolution of the PlayStation console. Pocket-lint. Pocket Lint. [2014-08-19]. （原始内容存档于2014-08-20）. ^ 11.0 11.1 Fahey, Rob. Farewell, Father. Eurogamer.net. 2007-04-27 [2012-03-08]. （原始内容存档于2012-08-17）. ^ Cowan, Danny. CDi: The Ugly Duckling. 1UP.com. 2006-04-25 [2012-03-08]. （原始内容存档于2012-11-04）. ^ Nutt, Christian. Birthday Memories: Sony PlayStation Turns 15. Gamasutra. [2012-03-08]. （原始内容存档于2011-02-14）. ^ Blake Snow. The 10 Worst-Selling Consoles of All Time. GamePro.com. 2007-05-04 [2007-11-25]. （原始内容存档于2007-05-08）. ^ Sony's Ken Kutaragi leaving. Engadget. Engadget. [2014-08-19]. （原始内容存档于2014-08-20）. ^ Swearingen, Jake. Great Intrapreneurs in Business History. CBS. 2008-06-17 [2015-11-16]. （原始内容存档于2013-10-12）. ^ 18.0 18.1 Edge staff. The Making Of: PlayStation. Edge. Future Publishing. 2009-04-24 [2012-03-07]. （原始内容存档于2012-05-16）. ^ IGN staff. History of the PlayStation. IGN. 1998-08-27 [2012-03-08]. （原始内容存档于2012-02-18）. ^ 20.0 20.1 The Nintendo PlayStation You Never Got To See. Kotaku.com. Kotaku. [2014-08-20]. （原始内容存档于2014-08-21）. ^ 21.0 21.1 21.2 21.3 History of the PlayStation. IGN. IGN. [2014-08-18]. （原始内容存档于2013-01-25）. ^ 22.0 22.1 Williams, Mike. Sega and Sony Almost Teamed Up on a Console. US Gamer. US Gamer. [2014-08-28]. （原始内容存档于2014-08-20）. ^ Original Nintendo/Sony PlayStation Prototype. Joystiq. Joystiq. [2014-08-18]. （原始内容存档于2015-01-28）. ^ Nintendo's 32-Bit Super Console!. Next Generation（英语：Next Generation (magazine)）. No. 26 (Imagine Media（英语：Imagine Media）). February 1997: 47. ^ Maru-Chang. SCPH. MiragePalace. [2010-06-30]. （原始内容存档于2010年3月16日）. 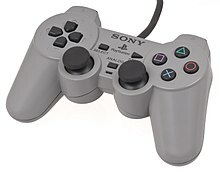 It's the second type of controller for PlayStation. The cable became long, and the noise filter was added. Other functions are the same as SCPH-1010. April 2, 1996 for ¥2500. ^ The Making Of: PlayStation. Edge. Future Publishing: 5. 2009-04-24 [2009-09-27]. （原始内容存档于2012-05-16）. ^ The Next Generation 1996 Lexicon A to Z: PS-X. Next Generation（英语：Next Generation (magazine)）. No. 15 (Imagine Media（英语：Imagine Media）). March 1996: 39. ^ How Virtua Fighter Saved PlayStation's Bacon. WIRED. 2012-09-05 [2015-11-16]. （原始内容存档于2014-10-14）. ^ Pssstt! Wanna Buy a Game System?. Next Generation（英语：Next Generation (magazine)）. No. 14 (Imagine Media（英语：Imagine Media）). February 1996: 77. ^ No Business Like Show Business. GamePro (57) (国际数据集团). April 1994: 8. ^ 31.0 31.1 31.2 Which Game System is the Best!?. Next Generation（英语：Next Generation (magazine)） (Imagine Media（英语：Imagine Media）). December 1995, (12): 36–85. ^ Sega and Sony Go to War. GamePro (国际数据集团). September 1995, (84): 138. ^ Can PlayStation Compete with Ultra 64?. Next Generation（英语：Next Generation (magazine)）. No. 15 (Imagine Media（英语：Imagine Media）). March 1996: 6–10. ^ 16-Bit Surge. GamePro. No. 91 (国际数据集团). April 1996: 16. ^ But It'll Sure Look Pretty on the Shelf.... Electronic Gaming Monthly (Ziff Davis（英语：Ziff Davis）). October 1995, (75): 16. ^ Trailing Sony, Sega Restructures. GamePro. No. 79 (国际数据集团). February 1996: 16. ^ Brandt, Richard L. "Nintendo Battles for its Life." Upside 7.10 (1995): 50-. ABI/INFORM Global. Web. 24 May 2012. ^ Game Machine Cross Review: プレイステーション. Weekly Famicom Tsūshin. No.335. Pg.166. 12–19 May 1995. ^ The Magazine Biz. GamePro. No. 77 (国际数据集团). December 1995: 17. ^ Sony TV: Turn On, Tune In, Buy Hardware. Next Generation（英语：Next Generation (magazine)）. No. 14 (Imagine Media（英语：Imagine Media）). February 1996: 72–73. ^ Digital Disciples: Sony's PlayStation Game Plan. Next Generation（英语：Next Generation (magazine)）. No. 6 (Imagine Media（英语：Imagine Media）). June 1995: 44–48. ^ Sony PlayStation Expo '96. GamePro. No. 101 (国际数据集团). February 1997: 44–45. ^ Sega: Who Do they Think you Are?. Next Generation（英语：Next Generation (magazine)）. No. 14 (Imagine Media（英语：Imagine Media）). February 1996: 71. ^ Sony: Who Do they Think you Are?. Next Generation（英语：Next Generation (magazine)）. No. 14 (Imagine Media（英语：Imagine Media）). February 1996: 70. ^ 45.0 45.1 45.2 45.3 Will the Real Boss of Sony Please Step Forward?. Next Generation（英语：Next Generation (magazine)）. No. 23 (Imagine Media（英语：Imagine Media）). November 1996: 6–10. ^ News Bits. GamePro. No. 95 (国际数据集团). August 1996: 17. ^ Dramatic Price Cuts Boost Sony and Sega Sales. GamePro. No. 96 (国际数据集团). September 1996: 20. ^ Svenson, Christian. Stat Happy Sony. Next Generation（英语：Next Generation (magazine)）. No. 24 (Imagine Media（英语：Imagine Media）). December 1996: 28. 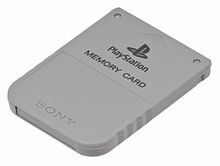 ^ PlayStation Systems - The Official PlayStation Museum. [2013-12-13]. （原始内容存档于2013-12-01）. ^ 50.0 50.1 Sony PlayStation 1 CD Player. Stereophile. Stereophile. [2014-08-19]. （原始内容存档于2014-12-02）. ^ 51.0 51.1 51.2 51.3 Sony PlayStation Specs. Cyberiapc. Cyberiapc. [2014-08-18]. （原始内容存档于2014-12-26）. ^ Cumulative Software Titles. Sony Computer Entertainment Inc. [2014-09-19]. （原始内容存档于2008-09-21）. ^ Cumulative Production Shipments of Software Titles. Sony Computer Entertainment. 2007-03-31 [2014-09-19]. （原始内容存档于2008-09-23）. ^ Search:. Gamefaqs Product page. Gamefaqs.com. 2008-03-18 [2010-11-11]. （原始内容存档于2012-06-27）. ^ Leo, John. Final Fantasy 25th anniversary Ultimate Box collection announced. GameSpot.com. 2012-08-31 [2014-03-05]. （原始内容存档于2015-11-09）. ^ Do Good Things Come in Small Packages?. Electronic Gaming Monthly. No. 92 (Ziff Davis（英语：Ziff Davis）). March 1997: 110–1. ^ Sony latest to toss hat in vid game arena. The Hollywood Reporter (Hollywood Reporter, Inc.). 1994-05-19. ^ Sony Computer Entertainment Announces Changes in Corporate Officers (PDF) (新闻稿). Tokyo: Sony Computer Entertainment. 2002-07-01 [2010-03-23]. （原始内容 (PDF)存档于2004-12-08）. ^ 75 Power Players: Back at the Lab.... Next Generation（英语：Next Generation (magazine)） (Imagine Media（英语：Imagine Media）). November 1995, (11): 73. ^ 61.0 61.1 Sony PlayStation 1st-gen specs difficulties. engadget. Engadget. [2014-08-18]. （原始内容存档于2014-08-19）. ^ Buyers Beware. GamePro. No. 102 (国际数据集团). March 1997: 20. ^ Official PlayStation website: PlayStation Vita, PS Vita; Specifications for PlayStationVita. [2011-03-07]. （原始内容存档于2012-01-07）. ^ Sony PS Handles TV Woes. Electronic Gaming Monthly. No. 79 (Ziff Davis（英语：Ziff Davis）). February 1996: 20. ^ 66.0 66.1 PSX Copy Protection. ConsoleCopyWorld. Console Copy World. [2014-08-18]. （原始内容存档于2014-08-18）. ^ Green, Garo; Kaufman, James (编). Video Games and Creativity. : 255 [2016-04-20]. ^ PSX protected games. ConsoleCopyWorld. Console Copy World. [2014-08-18]. （原始内容存档于2014-08-19）. ^ Svensson, Christian. Sony and the Bad Guys. Next Generation（英语：Next Generation (magazine)）. No. 25 (Imagine Media（英语：Imagine Media）). January 1997: 26. ^ datel Development. Datel. Datel UK. [2014-08-18]. （原始内容存档于2014-09-24）. ^ The Sony PlayStation Plays For Keeps. GamePro (68) (国际数据集团). March 1995: 36. ^ 72.0 72.1 72.2 Sony's Stocking Stuffers. GamePro. No. 87 (国际数据集团). December 1995: 185. ^ Review Crew: Horned Owl. Electronic Gaming Monthly (Ziff Davis（英语：Ziff Davis）). July 1996, (84): 28. ^ Soar and Descend. GamePro (国际数据集团). April 1996, (91): 24. ^ Datel Launches PlayStation Disk Drive. Next Generation（英语：Next Generation (magazine)）. No. 20 (Imagine Media（英语：Imagine Media）). August 1996: 25. ^ Reality Check. Electronic Gaming Monthly (Ziff Davis（英语：Ziff Davis）). August 1996, (85): 14–16. ^ 77.0 77.1 77.2 77.3 Sony's PlayStation Debuts in Japan!. Electronic Gaming Monthly (Ziff Davis（英语：Ziff Davis）). December 1994, (65): 70. ^ Tech Specs: Sony PlayStation. Next Generation（英语：Next Generation (magazine)） (Imagine Media（英语：Imagine Media）). December 1995, (12): 40. ^ Inside the PlayStation. Next Generation（英语：Next Generation (magazine)） (Imagine Media（英语：Imagine Media）). June 1995, (6): 51. ^ Nocash PSX Specifications. [2015-11-16]. （原始内容存档于2015-10-22）. ^ Everything You Have Always Wanted to Know about the Playstation But Were Afraid to Ask.. [2015-06-06]. （原始内容存档于2015-04-23）. ^ PlayStation Vs. Saturn: Battle of the Polygon Monsters. Electronic Gaming Monthly (Ziff Davis（英语：Ziff Davis）). February 1995, (67): 94–95. ^ PlayStation 1: The audiophile's dream?. Destructoid. Audiophile. [2014-08-19]. （原始内容存档于2014-10-06）. ^ Tidbits. Electronic Gaming Monthly. No. 88 (Ziff Davis（英语：Ziff Davis）). November 1996: 22. ^ Net Yaroze. IGN. [2014-02-28]. （原始内容存档于2014-03-17）. ^ 86.0 86.1 SCEE 2000—Key Facts and Figures. Sony Computer Entertainment Europe. [2006-11-25]. （原始内容存档于2007-09-19）. ^ 87.0 87.1 Smith, Tony. Sony PS One sales rocket as PS Two famine continues. theregister.co.uk. 2000-06-06 [2008-08-22]. （原始内容存档于2009-05-22）. ^ PsOne LCD Screen. Bit-Tech. Bit-Tech. [2014-08-19]. （原始内容存档于2014-08-20）. ^ Robertson. ps3 backward compatibility. me. [2017-02-20]. （原始内容存档于2016-11-28）. ^ Dave James and James Rivington. Sony PS4 review. TechRadar. [2015-11-16]. （原始内容存档于2013-11-11）. ^ Whitehead, Dan. Dreamcast: A Forensic Retrospective Article • Page • Articles • Retro •. Eurogamer.net. 2009-02-01 [2012-10-21]. （原始内容存档于2016-08-20）. ^ PlayStation 2 Timeline. GameSpy: 3. [2008-08-19]. （原始内容存档于2004-06-04）. ^ Gantayat, Anoop. Sony Outlines PSP Future. IGN. 2006-03-15 [2008-07-10]. （原始内容存档于2008-10-07）. ^ User's Guide – Remote Play. Sony Computer Entertainment. [2008-03-12]. （原始内容存档于2008-03-11）. ^ Support – PSP – Connecting to the Internet. Sony Computer Entertainment. [2008-12-03]. （原始内容存档于2008-03-13）. ^ Goodfellow, Kris. Sony Comes On Strong in Video-Game War. New York Times. 1998-05-25. （原始内容存档于2016-03-08）. ^ Sony PlayStation vs Nintendo 64. DigitalSpy. Digital Spy. [2014-08-19]. （原始内容存档于2014-08-20）. ^ PlayStation is number 7. IGN. [2012-10-27]. （原始内容存档于2012-11-13）. ^ 101.0 101.1 101.2 McKinley Noble, GamePro. 5 Biggest Game Console Battles. PCWorld. 2009-08-31 [2012-10-27]. （原始内容存档于2013-05-28）. ^ Sega vs. Sony: Pow! Biff! Whack!. Businessweek.com. 2000-12-18 [2012-10-27]. （原始内容存档于2001-01-25）. ^ Nintendo Power August, 1994 - Pak Watch. Nintendo. 1994: 108. ^ 104.0 104.1 The Game: PlayStation vs N64. Forbes. Forbes. [2014-08-18]. （原始内容存档于2014-08-19）. ^ Elusions: Final Fantasy 64. [2009-01-19]. （原始内容存档于2012-01-23）.